MAXIM Integrated Products, represented by Arrow Electronics , has introduced the MAX1272/MAX1273. 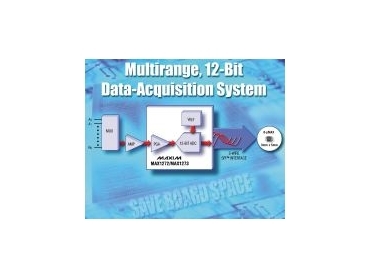 Packaged in a small, 8-pin microMAX, these single-channel, multirange, 12-bit data-acquisition systems operate off a single 5V supply and convert at 87.5ksps. With four software-selectable input ranges, the MAX1272 accepts ±10V, ±5V, 0 to 10V, and 0 to 5V input signals, while the MAX1273 accepts ±Vref, ±Vref/2, 0 to Vref, and 0 to Vref/2. The MAX1272/MAX1273 are ideal for industrial control systems, data-acquisition systems, robotics, and medical instrumentation. The MAX1272/MAX1273 incorporate input fault protection, an internal track/hold with an input bandwidth of 5MHz, and an internal 4.096V reference. Software-selectable input-range switching increases the effective dynamic range to 14 bits and enables these parts to measure input signals as large as ±10V while operating from a +5V single supply. The MAX1272/MAX1273 interface directly to SPI(TM)/QSPI(TM) and MICROWIRE devices without additional circuitry. Software-selectable power-down modes result in currents as low as 1A between conversions. The MAX1272/MAX1273 are available in the commercial (0ºC to +70ºC) and extended (-40ºC to +85ºC) temperature ranges.